Snood (Small 9" - 10" long) Assorted plain colours. Worn over dogs heads to hold ears back whilst eating and drinking. Fancy type. Snood (Large 11 - 12" long) Assorted plain colours. Snood X Large 14" - 15" long) Assorted plain colours. Small Pom Covers for Toys. Helps keep the "poms" clean on Poodles. Helps keep the " Poms" clean on Poodles. 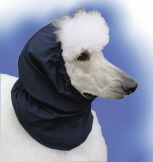 Overall length approximately 4" - 5"
Pom Covers Large for Standard Poodles. Leggins. For keeping leg furnishings clean and dry. Size: Pom Cover type Leggins will Fit Standard Poodle Size Dog - Velco to fasten top of Pom Cover and elasticated bottoms.